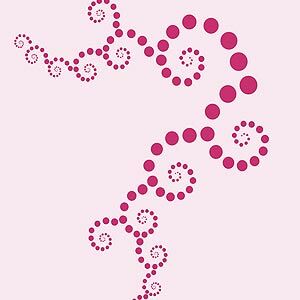 The Funky Spirals Theme Pack Stencil is a 3 sheet stencil containing 7 differently sized dotty spirals with dots going from small to large in each spiral motif, giving a modern open spiral shape. Ideal for covering large spaces with swirling patterns of spirals going from large to small. 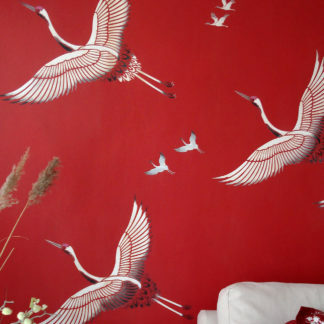 Use as single motifs or in loosely flowing sequences, which have echoes of modern Japanese style. Spirals and Swirls are great for creating impressive contemporary wall features, or for elegant curtains and drapes, with details echoed on cushions. Three sheet stencil – see size and layout specifications below. 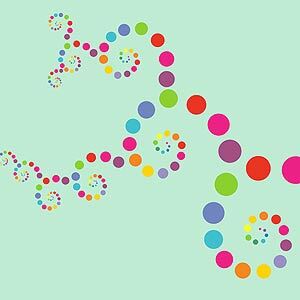 For variations try placing spirals apart at random distances, stencilled in single colours; or try the dots in different bright tones for fun schemes, repeating the colour sequence in each spiral; or rotate spirals and join them at different angles to create swirling patterns. 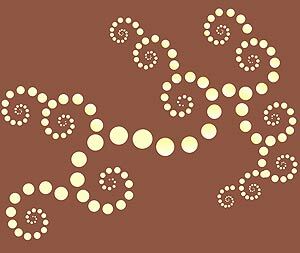 Working from large to small, join the spirals by lining up the dot at the end of the spiral to be stencilled with the same sized dot of the spiral you are joining to, or overlap these dots – either system works well. Use our examples here as a guide to get you started. 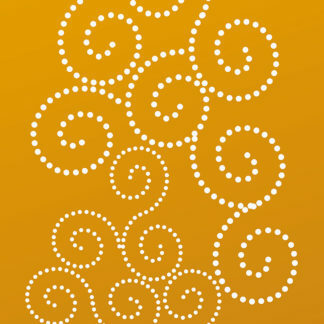 Above top – the seven spirals of the Funky Spirals Theme Pack stencilled in an upright position in a random repeat pattern. 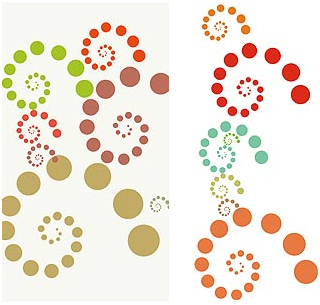 The spirals are stencilled in a selection of bright colours which is repeated in the same sequence for each spiral. Motif Stencil Paints used here are Indian Purple, French Lavender, Cerise, Very Berry, Verbena, China Blue, Paradise Blue, Seville Orange, Harvest Gold, Emerald Forest and Sea Green (smaller dots in centre) – all on a baby pink background. 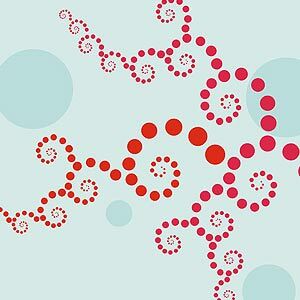 Above – the seven spirals of this theme pack stencilled from large to small to create a decreasing coil perspective. Above left – in mulit-coloured palette (colours listed top right); above right – in Ice White Stencil Paint on a sky blue background. 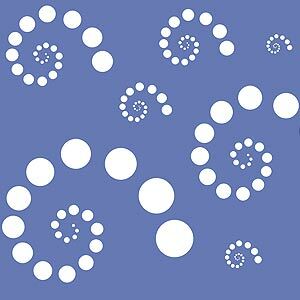 Above – the seven spirals of this theme pack stencilled as random groups. 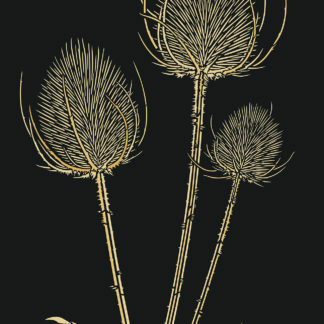 Above left – in Verbena, Grassland, Chocolat and Sienna; above right – in Seville Orange, Harvest Gold, Very Berry, Lime Blossom and Willow Stencil Paints. 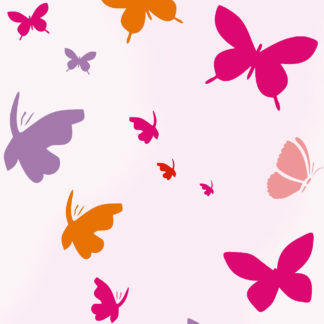 Above – the stencils of this theme pack in a continuous flowing arrangement, stencilled in Evening Primrose Stencil Paint on a light raspberry pink background. Below the same colours applied on a chocolate background. 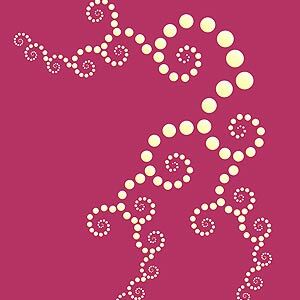 See also the Small Dotty Spirals Stencil, the larger Oversize Dotty Spiral, Classic Dotty Spirals and the Dotty Swirls Theme Packand the Dotty Waves Theme Pack. Other circle options include the Dotty Circles Stencil Theme Pack – as well as the Circles Theme Pack Stencil and Outline Circles Stencil,or the larger Oversize Outline Circles Stencil. 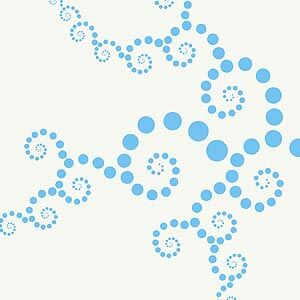 Above – the seven spirals of the Funky Spirals Theme Pack stencilled horizontally in a random pattern in Ice White Stencil Paint on a chalky blue background. 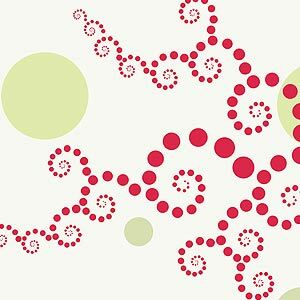 Above – the seven spirals of this theme pack in a large trailing pattern achieved by starting with the large spiral and then placing the last outer dot of a smaller stencil next to the same sized dot in the original print and stencilling each successive smaller spiral in this way. 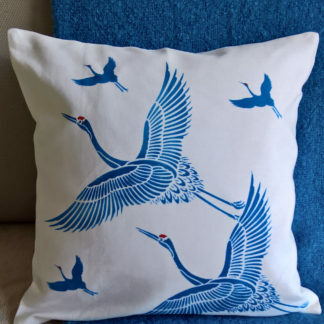 Change angles and direction of the pattern by rotating the stencil and adding new ‘branches’ of the design – see our different graphic examples on this page for different layout possibilitiles. Above – continuous spirals in Summer Skies Stencil Paint on a white-grey background. 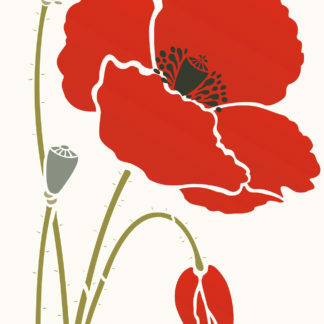 Below – in a multi-coloured palette (colours same as listed top of this page) on a mint green background. 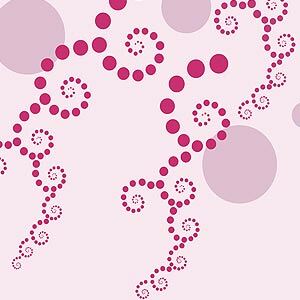 Above and below – the spirals of this theme pack in flowing continuous patterns (see above for technique) – stencilled in Cerise Stencil Paint on a pale pink background. 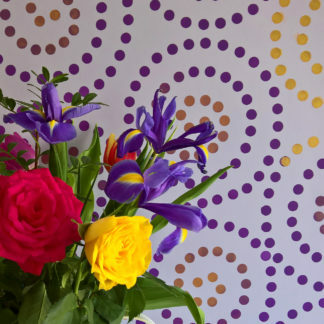 Below – the same colours with our Circle stencils stencilled in Plum Blossom Stencil Paint. 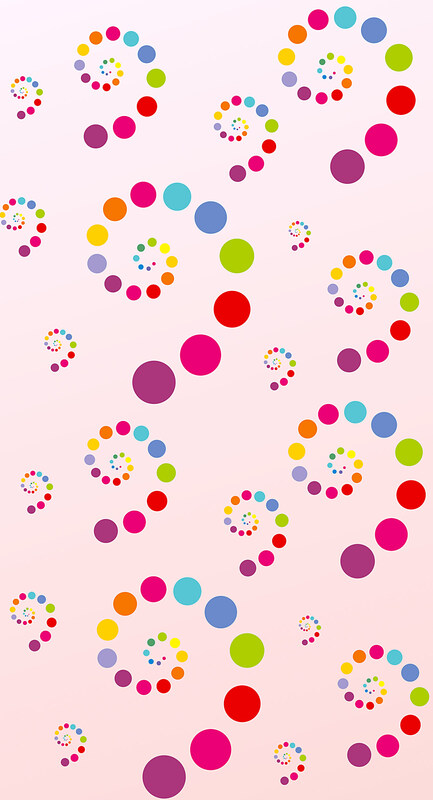 Above – the spirals of this theme pack in a flowing continuous pattern (see above for technique) – stencilled in Cerise and Very Berry Stencil Paint on an aqua background with the Circles Stencil in Duck Egg Stencil Paint. 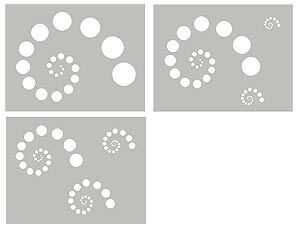 This three sheet stencil theme pack comprises seven different sized dotty funky spiral stencils on 125 micron mylar. 1. Approximate width of the largest spiral is 52cm/20 1/2″ on a sheet 60cm x 46cm. Largest dot size 10cm, samllest dot size 0.8cm. 3. 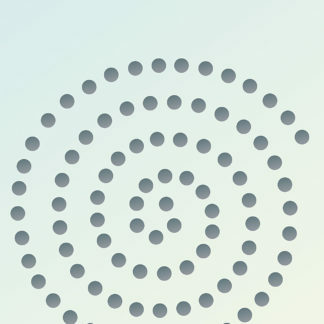 Approximate widths of the three medium sized spirals are 29cm/11 1/4″, 20cm/8″, 14cm/5 1/2″ – largest dot sizes 6cm, 4cm, 2.5cm respectively. Same size sheet. 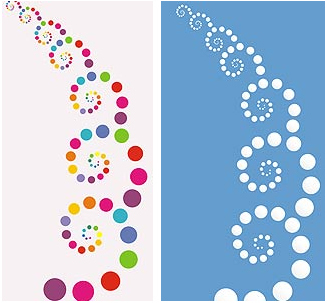 Left – the three stencil sheets of this theme pack showing the seven different sized spirals.